When you use the Facebook Recommendations Box plug-in on your site, visitors who are logged in to their Facebook accounts see a list of the content that generated the most Likes across your site, making your site more relevant to visitors. To add a Recommendations Box to a web page on your site, follow these steps. 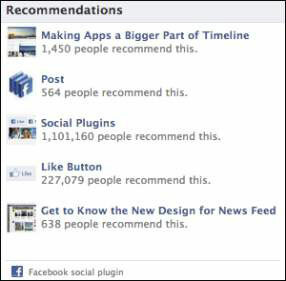 Visit Facebook’s Plug-ins Page and click the Recommendations Box link. Domain: Enter the specific URL for the plug-in. App ID: This allows you to display associated actions on Facebook. Click here for more on a list of available actions you can associate with an app. Action: List actions for the app, separating each with a comma. Width: Select the desired width for the plug-in. Height: Select the desired height for the plug-in. Header: Show or hide the header in the plug-in. Link Target: Determine if you want the links to open in a new window or open in the same browser window. Font: Select the desired font from the drop-down menu. Click Get Code and add to your website. You can think of the Recommendations Box plug-in as a Facebook-powered version of most-popular lists, as chosen by a user’s friends and other Facebook members. When you integrate this plug-in with your website, visitors see these recommendations in real time, so the recommendations most likely change every time users visit the site. Place the Recommendation Box plug-in on your website’s home page so that you can immediately make a connection with your website visitors and provide a more personalized experience for them.